Tesla Motors have announced Australian pricing for its Model S which starts at $91,400 plus on-road costs for the Model S 60 and tops out at $133,257 for the high-performance P85. The base model can be had for about $107,000 driveaway in Melbourne or Sydney, while the range-topper is about $140,000. This reflects the growing affordability of electric cars, as this pricing is about half that of the Tesla Roadster which pioneered the brand Down Under in 2011 at $222,995 driveaway for the base model and $260,535 for the Sport. Australian orders for the American-made plug-in Model S are now being taken on Tesla’s website, two years after the model went on sale in the United States. Tesla, which expects to sell 35,000 of the five-door liftback Model S sedans globally this year, is planning to re-establish a retail showroom in Sydney, along with sales representation in Melbourne and a dedicated service facility. Expected to land in Australia by August, the three-model range will offer three levels of performance, depending on battery size and electronic tweaks. The base Model S 60 boasts 225kW of power from its 60kWh lithium-ion battery pack, driving the large sedan from zero to 100km/h in 6.2 seconds – about the same as a V6 Holden Commodore – and to a top speed of 190km/h. Official driving range on a full battery charge is said to be 390km. Stepping up to the mid-range $111,807 Model S 85 adds more battery oomph (85kWh) for more power (270kW), faster acceleration (5.6 sec to 100km/h) and greater range (502km). The $119,900 flagship P85 – P stands for performance – has the same 85kWh battery and 502km range as the 85 but adds an enhanced electric drivetrain for faster acceleration. 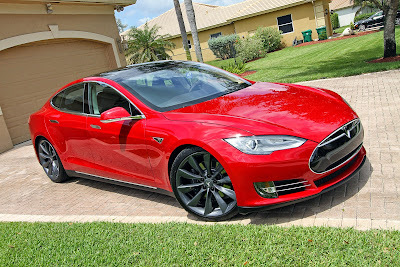 Tesla says the P85 can cover the 0-100km/h sprint in 4.4 seconds – a split second faster than the 4.4-litre V8 BMW M5. And it is about $100,000 cheaper, too, at least in base format that is well short of the M5’s feature level. If the Tesla buyer ticks all the boxes for optional extras, including a performance suspension and 21-inch wheels package, ‘tech’ package (a bundle of electricals that includes sat-nav, keyless entry, memory seats and power tailgate, among others), and other extras, the price can top $170,00, plus on-roads. In standard form, the Model S is available in one exterior colour – flat black – with 19-inch alloy wheels, cloth seats and piano black interior trim. Metallic paint in a variety of colours costs between $900 and $1800, while leather is also $1800. A glass panoramic roof is a $3100. The standard on-board charger comes with a 40-amp single-phase wall connector. For an extra $1800, a buyer can have twin chargers fitted to reduce charging time. As well, Tesla promises to establish a network of “Tesla Superchargers” that it claims can replenish the batteries by more than half in a little as 20 minutes. The facility will be free to Model S 85 and P85 owners, but requires a $2700 tweak for 60 buyers. Because “green” cars get luxury car tax breaks in Australia, but the flagship P85 still attracts $13,357 in tax. The Tesla website provides driveaway pricing that varies by state and territory, with the Australian Capital Territory the cheapest and Western Australia the dearest. For example, the driveaway price for the base Model S 60 in the ACT is $103,095, while in WA it is $109,363.